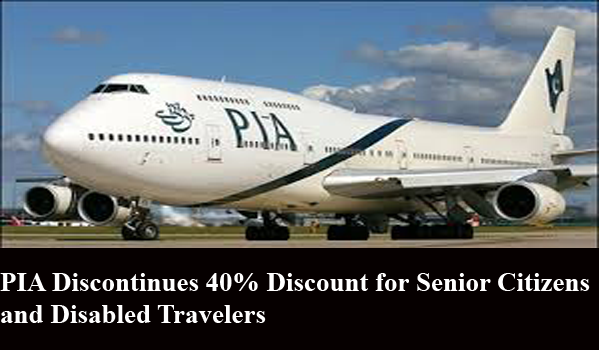 PIA Discontinues 40% Discount for Senior Citizens and Disabled Travelers. There is sad news from Pakistan International Airline (PIA), the airline has discontinues to offer 40% discount for the senior citizen and disabled travelers. PIA is suffering the financial loss and now the airline has declared that it is ending the 40% discount reserved for senior citizens and disabled travelers. PIA was offering the 20% discount for senior citizens 65, and above for traveling to and from the UK, the USA, Ireland, Canada, Europe, and Asia. The discount was applicable to domestic flights in economy, business, & economy plus flights. While the airlines was offering 40% discount for disabled along with 20% discount to their attendants on flights to Pakistan from Bombay, Delhi, Dhaka and Kabul.